Pin 2 Blue with white rings (very old cable used to be a solid blue colour). Pin 3 Orange with white rings (very old cable used to be a solid brown colour). Pin 4 White with orange rings (very old cable used to be a solid green colour). Pin 6 White with blue rings (very old cable used to be a solid orange colour). In a normal household, pins numbered 1 and 6 in phone sockets are not used, so you only need 4 core cable for extensions. 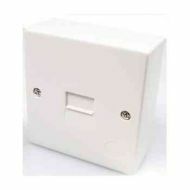 Orange is called the “B” wire and is normally connected to either pin 2 in the master socket or if it is the newer NTE5 style socket (shown below), its own B terminal. If you measure the Voltage with a multimeter, it should be about minus 50 Volts DC with respect to earth. 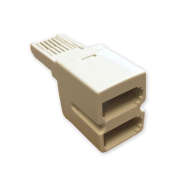 White is called the “A” wire and is normally connected to either pin 5 in the master socket or if it's the newer NTE5 style socket, its own A terminal. If you measure the Voltage with a multimeter, it should be about the same as earth. You should also be able to measure 48-50 Volts between "A" and "B". Be careful with your phone wiring, if you make a mess of things your phone company can (and probably will) charge £100+ for a callout. Master flush mounting telephone socket, with standard BT style connection. 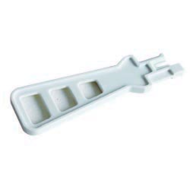 Surface mount telephone master socket. 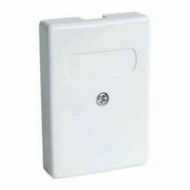 NTE5A master telephone socket provides a clear demarcation between the telephone operators network and the customer extension wiring via a removable connection unit (lower half). 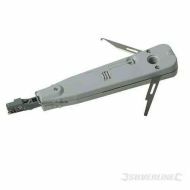 The product also provides line test, ringing components and over voltage protection. 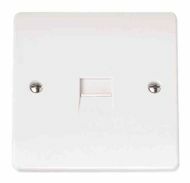 Slave flush mounting phone socket (standard UK / BT type). Surface mount telephone slave (extension) socket. 4 core cable for phone extension wiring. 6 core cable for phone extension wiring (though 4 core is more common). Sold per metre, buy as much as you like (up to 100m) and get it all in one big length. 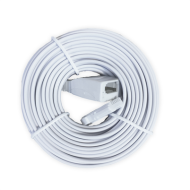 10 metre phone extension lead. Male BT plug on one end, female socket on the other. 5 metre phone extension lead. Male BT plug on one end, female on the other. Telephone junction box (6 Way) - six pairs of screw terminals inside. Connect two telephones to one socket. 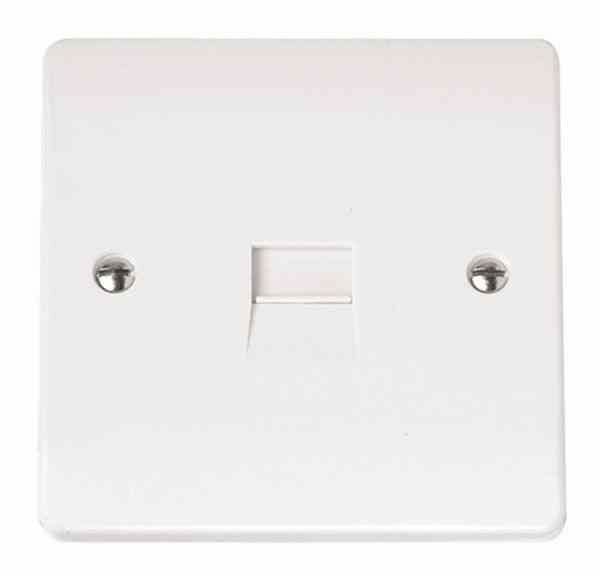 Twin slave (extension) flush mounting telephone socket. Two sockets for two separate phone lines.